What is an Identity Cloud? Home » Blog » What is an Identity Cloud? A new term is being thrown around in the IT management world—identity cloud. 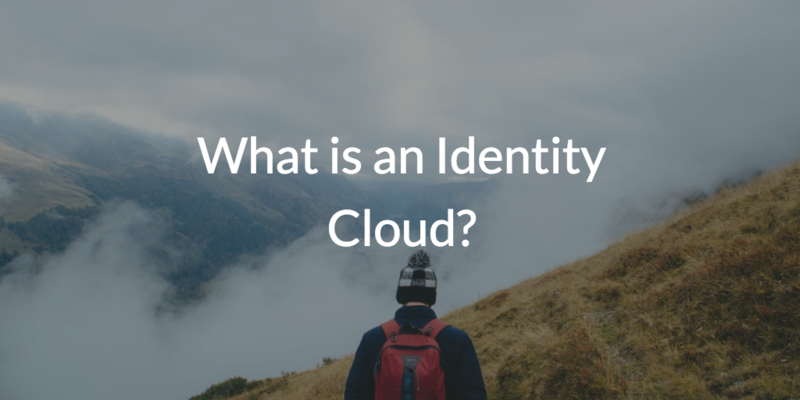 But, what is an identity cloud, and how can it help you and your organization? With the advent of modern microservices, the concept of an identity cloud is quite interesting. To answer this question, we must first look at identity management. Identity and access management for the most part has been stuck in the past because of its foundational layer. In the 1990s and early 2000s, IT environments were dominated by Microsoft® Windows®. Microsoft leveraged their hold on the market to build an identity and access management (IAM) solution called Active Directory® (AD). This identity provider would go on to become a mainstay in virtually all IT environments. This, of course, made a great deal of sense because of the reliance on Windows in IT environments. AD made it seamless to control user access and the systems themselves. But, challenges started to emerge as organizations began to leverage web applications, cloud infrastructure, Mac® and Linux® systems, WiFi, cloud and non-Windows file servers, and other IT resources. Active Directory struggled to connect users to these IT resources, so IT organizations started to create layers of solutions on top of their AD directory services architecture. Over time, this approach became unwieldy, costly, and fragile. A new approach to identity management was needed. The result was a microservices architecture of authentication that could be summarized as an identity cloud, or perhaps more accurately as a cloud directory service. IT admins could leverage a cloud directory service where users would be housed and IT resources would authenticate against this cloud-hosted identity provider. As a concept, the identity cloud would enable cross-platform, multi-protocol authentications regardless of the location of the user or the IT service. Ideally, this authentication microservice would be extremely lightweight for the IT organization to manage and enable quick, easy deployment to users and IT resources. The concept of an identity cloud that has central user management, cloud LDAP, virtual RADIUS, system management, web application single sign-on, multi-factor authentication, and much more makes a great deal of sense. The benefits to IT admins are significant with the elimination of hardware, software, VPN, security solutions, networking, etc. On top of that, the ongoing management and maintenance required for on-prem identity management infrastructure is also eliminated by a microservice identity cloud that doesn’t require anything on-prem. This concept of a cloud hosted identity provider is available in JumpCloud® Directory-as-a-Service®. Directory-as-a-Service is a reimagined Active Directory for the cloud era. The cloud-based directory solution combines a hyper-secure, centralized user management with True Single Sign-On™ to provide users access to both on-prem and cloud-based IT resources like AWS®, G Suite™, Salesforce®, and more, as well as file shares and networks via RADIUS and Samba––all with one login. Even better, JumpCloud is platform-agnostic and can authenticate user devices on Windows, Mac, and Linux systems. For answers to questions like what is an identity cloud and others, contact us. Our experts would be happy to help. To see the identity cloud capabilities of JumpCloud, try Directory-as-a-Service for free or schedule a demo.